You see it on Christmas and New Year celebrations. You see it on birthdays and fiestas, too. Actually, it’s even present during Christening and wedding receptions. 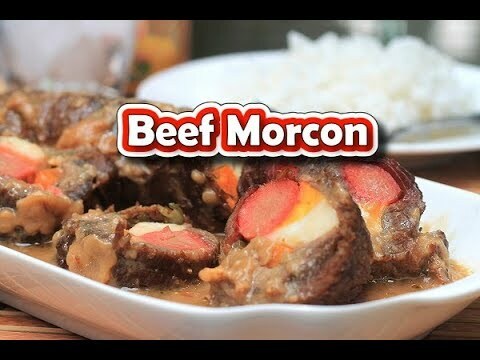 The ever ubiquitous Beef Morcon is definitely a beloved Pinoy staple! This yummy meat roll dish has always been a part of special occasions for many Filipino homes. The tasty meat combined with the other ingredients (such as carrots, cheese, hard-boiled eggs, pickles, etc) makes this an irresistible treat. For this blog entry, you will learn how to cook the Beef Morcon, a Pampanga specialty that has captured the taste of Pinoys and foreigners alike. Besides, this is a dish that frequently gets ordered not only in local carinderias but even in Pinoy-themed restaurants located abroad. Beef Morcon, by nature, is actually easy to prepare and to cook. However, marinating takes up a whole chunk of time and so if you need this for a specific event, you should start working on this dish at least one day in advance. Here are the ingredients and the procedure for preparing your own Beef Morcon. Happy cooking! Pour the Calamansi Juice or Lemon Juice into the meat. Add the Soy sauce into the mixture. Arrange the meat and marinate the beef for at least 1 hour. Put marinated beef in a flat surface and place on one side the pickles, hotdog, carrot, cheese, and egg. Enclose the filling with the Meat then roll it and tie with a cooking string, this will ensure that the meat will not open-up. Place the flour into a baking pan then dredge the rolled beef into the flour. Pour the cooking oil into the pan and apply heat. Fry the Morcon until it turns medium brown. Transfer the fried Morcon in a deep pan or casserole and pour the beef stock then bring to a boil. Pour half of the Morcon marinade and salt. Put the cover and simmer for about 2 hours or until the beef is tender. Remove the strings from the meat and slice the Morcon into serving sizes and place in a serving dish and add the sauce. Beef Morcon Recipe is a yummy meat roll, a popular Filipino dish that is always been a part of special occasions for many Filipino homes. I’ve never seen a dish anything like this. Thanks for sharing! This recipe looks interesting and delicious. Going to give it a try. I have never tried this recipe for beef before this post. It sounds delicious. I’ve never heard of Beef Morcon before, I love trying new recipes! This looks absolutely delicious! I am going to try this recipe out next week.